compared with unsafe CSOM and of tympanoplasty as compared with tympanoplasty with mastoidectomy. This was a prospective study, carried out at Department of Otorhinolaryngology, Himalayan Institute of Medical Sciences, Dehradun, a tertiary care centre in the state of Uttarakhand, from November 2010 to October 2011. A total of 80 patients were included in the study. The inclusion criteria were as follows: Patients aged more than 12 years, diagnosed as having CSOM, having pure conductive hearing loss, and posted for ear surgery. The exclusion criteria were as follows: Patients who were less than 12, had malignancy of middle ear, otitis externa, previous history of ear surgery, complications of CSOM, history of ear trauma, and mentally retarded. The selected patients were subjected to a detailed history and complete ear, nose, and throat examination. The ears were examined by otoscopy initially and subsequently by a microscope and otoendoscope to establish a pre-operative diagnosis of safe or unsafe disease. All patients underwent a pre-operative pure-tone audiometry (PTA) to find out the hearing status and to obtain documentary evidence for the same, and X-ray mastoid (bilateral Schullre's view) to assess the pathology and surgical anatomy of the mastoid. All patients included in the study were categorized into three groups according to the surgery planned: Group-A: Tympanoplasty, Group-B: Canal wall up (CWU) mastoidectomy with tympanoplasty, and Group-C: CWD mastoidectomy with reconstruction. Post-operatively, after 10 weeks and 6 months, audiological examination (PTA) was carried out to compare pre-and post-operative hearing status. A total of 80 cases were selected for this study and divided into 'safe' and 'unsafe' CSOM based on history, clinical findings, and intra-operative findings. 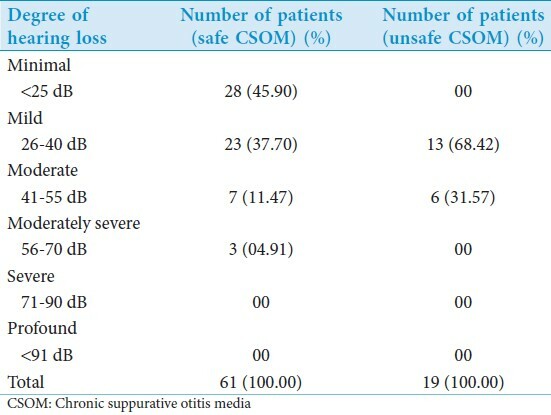 The number of cases with safe CSOM was 61 (76.25%) and that with unsafe CSOM was 19 (23.75%). The patients were aged between 14 and 74 years (mean age: 32.2 years). The number of male and female patients was 48 (60.00%) and 32 (40.00%) (M:F = 1.5:1.0), respectively. The primary complaints of the patients were ear discharge in 80 (100%) cases and hearing loss in 74 (92.50%) cases. The duration of ear discharge ranged from 6 months to 50 years. Maximum number of patients, that is, 30 (37.50%) cases, had duration of ear discharge of 10-15 years. Duration of hearing loss complaint was present from 6 months to 30 years. Maximum number of patients, that is, 34 (42.50%) cases, complained of hearing loss from 1 to 5 years, whereas 6 (07.50%) cases had no hearing loss. Based on intra-operative findings, the patients were reclassified into safe CSOM (53 (66.25%)) and unsafe CSOM cases (27 (33.75%)). Intra-operatively, eight (10.00%) cases, which were clinically diagnosed as safe, were found to be unsafe. In our study, 53 (66.25%) cases underwent Group-A surgery, 23 (28.75%) cases Group-C surgery, and 4 (05.00%) cases Group-B surgery. Hearing loss was assessed by PTA in three frequencies, 500, 1000, and 2000 Hz, and ABG was calculated. In our study average pre-operative hearing loss in 80 cases of CSOM was 33.58 dB. Postoperatively, at first follow-up of 10 weeks, average hearing loss in 80 cases was 26.35 dB. Hence, postoperatively at 10 weeks an average gain of 7.23 dB was seen. A total of 53 cases were in Group-A (tympanoplasty) where average hearing loss pre-operatively was 31.98 dB and postoperatively at 10 weeks average hearing loss was 24.18 dB. Hence, an average gain of 7.8 dB was noticed in Group-A. A total of 4 cases were in Group-B (CWU mastoidectomy with tympanoplasty) where average hearing loss pre-operatively was 30.00 dB and postoperatively at 10 weeks average hearing loss was 26.5 dB. Hence, an average gain of 3.5 dB was noticed in Group-B. A total of 23 cases were in Group-C (CWD mastoidectomy with tympanoplasty) where average hearing loss pre-operatively was 37.91 dB and postoperatively at 10 weeks average hearing loss was 31.30 dB. Hence, an average gain of 6.61 dB was noticed in Group-C. Overall, postoperatively at 10 weeks an average gain of 11.76 dB and an average loss of 6.94 dB was seen in all 80 cases of CSOM. A total of 30 (37.50%) patients were examined at second follow-up of 6 months, of which 15 had safe CSOM and 15 patients had unsafe CSOM. On second follow-up at 6 months, average pre-operative hearing loss in 30 cases of CSOM was 32.64 dB and average hearing loss in 30 cases was 24.1 dB. Postoperatively, at months, an average gain of 8.54 dB was observed. In this study all 15 cases of safe CSOM underwent type-I tympanoplasty. Pre-operative average hearing loss in 15 cases diagnosed as safe CSOM intra-operatively was 28.4 dB, whereas postoperatively at second follow-up of 6 months average hearing loss in cases of safe CSOM was 18.13 dB. Hence, postoperatively an average hearing gain of 10.27 dB was seen in patients of safe CSOM [Table 4]. In 15 cases diagnosed as unsafe CSOM, the majority of the 11 (36.66%) underwent CWD mastoidectomy with tympanoplasty. Average hearing loss in these 15 cases was 34.13 dB pre-operatively, which at second follow-up of 6 months was 30.06 dB. Thus an average gain of 4.07 dB was observed. A total of 15 cases were in Group-A (tympanoplasty) where average hearing loss pre-operatively was 28.4 dB and postoperatively at 6 months average hearing loss was 18.13 dB, Hence, an average gain of 10.27 dB was noticed in Group-A. A total of 4 cases were in Group-B (CWU mastoidectomy with tympanoplasty) where average hearing loss pre-operatively was 30.00 dB and postoperatively at 6 months average hearing loss was 31.5 dB. Hence, an average loss of 1.5 dB was noticed in Group-B [Table 5]. Overall, postoperatively at 6 months an average gain of 12.55 dB and an average loss of 9.83 dB were seen [Table 6]. A total of 11 cases were in Group-C (CWD mastoidectomy with tympanoplasty) where average hearing loss pre-operatively was 35.63 dB and postoperatively at 6 months average hearing loss was 29.54 dB. Thus, an average gain of 6.09 dB was noticed in Group-C [Table 7]. In this work we studied a total of 80 patients of CSOM to compare pre- and postoperative hearing status. The duration of hearing loss was in all cases found to be lesser than duration of ear discharge. This may be attributed to difficulty in appreciating minor degrees of hearing loss by the patient. Hearing loss would be noticed only when the disease had progressed sufficiently to cause significant impairment of hearing by perforation or ossicular destruction. Shrestha, et al. noticed a net gain of 8.0 dB in patients undergoing CWD mastoidectomy with tympanoplasty, which was also in accordance with our study where a net gain of 6.61 dB was noticed at 10 weeks and a gain of 6.09 dB at 6 months in Group-C (CWD mastoidectomy with tympanoplasty). In this study we found that postoperative hearing results were better in the case of safe CSOM as compared with unsafe CSOM and of tympanoplasty as compared with tympanoplasty with mastoidectomy. 1. Shrestha S, Sinha BK. Hearing results after myringoplasty. Kathmandu Univ Med J 2006;4:455-9. 2. Gupta A, Gupta. A study of prevalence of complications of suppurative otitis media in rural area of Loni. Ind J Otol 1996;2:177-83. 3. Akinpelu OV, Amusa YB, Komolafe EO, Adeolu AA, Oladele AO, Ameye SA. Challenges in management of chronic suppurative otitis media in a developing country. J Laryngol Otol 2008;122:16-20. 4. Gulati SP, Sachdeva OP, Kumar A. Audiological profile in chronic suppuartive otitis media. Ind J Otol 2002;8:24-8. 5. Slattery WH. Pathology and clinical course of inflammatory diseases of the middle ear. In: Glasscock ME, Gulya AJ, editors. Glasscock-Shambaugh Surgery of the Ear. 5 th ed. New Delhi: Reed Elsevier India Pvt. Ltd; 2003. p. 428-9. 6. Slattery WH. Pathology and clinical course of inflammatory diseases of the middle ear. In: Glasscock ME, Gulya AJ, editors. Glasscock-Shambaugh Surgery of the Ear. 5 th ed. New Delhi: Reed Elsevier India Pvt. Ltd; 2003. p. 403. 7. Singh RK, Safaya A. Middle ear hearing restoration using autologous cartilage graft in canal wall down mastoidectomy. Indian J Otol 2005;11:10-4. 8. Ajalloueyan M. Experience with surgical management of cholesteatomas. Arch Otolaryngol Head Neck Surg 2006;132:931-3. 9. Chandra R, Mishra R. Some observations on the total and subtotal perforations of the tympanic membranes. Ind J Otolaryngol 1964;16:3-20. 10. Rupa V, Raman R. Chronic suppurative otitis media: Complicated versus uncomplicated disease. Acta Otolaryngol 1991;111:530-5. 11. El-Sayed Y. Bone conduction impairment in uncomplicated chronic suppurative otitis media. Am J Otolaryngol 1998;19:149-53. 12. Ashok SK, Munshi DM, Ghosh SN. Evaluation of improvement of hearing in type I tympanoplasty and its influencing factors. Ind J Otol Head Neck Surg 2006;58:253-7. 13. Goyal R. Role of cortical mastoidectomy in type I tympanoplasty. Ind J Otol 2010;16:8-12. 14. Shrestha BL, Bhusal CL, Bhattarai H. Comparison of pre and post-operative hearing results in canal wall down mastoidectomy with type III tympanoplasty. JNMA J Nepal Med Assoc 2008;47:224-7. 15. Mathai J. Myringoplasty with temporalis fascia: Analysis of 200 cases. Ind J Otol Head Neck Surg 1999;51:9-12. 16. Varshney PK, Gupta R. Canal wall up versus canal wall down procedure: Comparative evaluation. Ind J Otol. 2009;15:20-2.